Note: a newer design exists for keeping signals in place. This design was dropped because of power requirements and required depth of space. Model signals are precious items that can get damaged easily. Not only the costs of the etches themselves but primarily the time to put these together, paint them and make them work require an investment of many hours. This investment can be lost in a few seconds by careless track cleaning or a mishappening during transport of a module. Therefor it is not a bad idea to design these in such way that they can be easily removed. Of course seperate transport might form a new source for other disasters. With this in mind I played around with some materials to see if this idea was feasible. This one here is based on the use of memory wire. I mainly wanted to experiment with the stuff to see if the advantage of simplicity + space requirement outweighs the drawback of high energy requirement. This material is certainly not the only option but one advantage is that the combination of signal with drive unit is removable instead of signal only. An alternative is of course a dedicated wire spool wound for the same space. Memory wire is suitable for a linear motion in a linear space. For the signal in case based a german etch set, I found that 60 mm wire was required for a direct drive without any lever enlarging the useful path. The pathlength required was about 2 mm for this version. In this case the entire drive could be easily built into a tube of 8 mm inside diameter with a length of 75 mm. There is enough room left for another drive for a second arm on the signal. 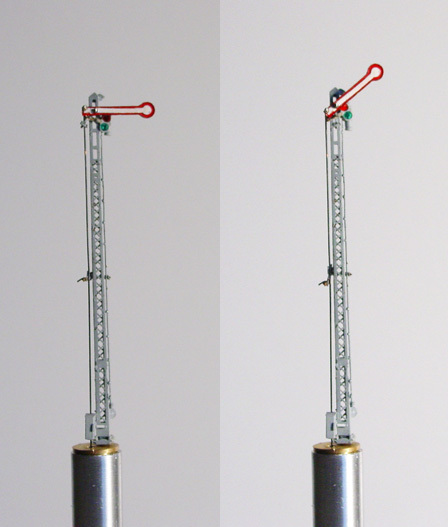 The signal is mounted on a base and the rod connecting the arm is led throug a short piece of tube. The tube connects the piece of PCB to the base. The rod is connected to the memory wire via a short piece of brass. Adjustments are only once while fixing. The surrounding tube protects the wire from the environment thus I expect relative little influence of things like draught or direct contact. The electrical connection is open for further developments. Ideal is a set of connectors that lock in when the signal is stuck in its place. Possibly something like a set of wipers on the outside similar to a jackplug. Minimum is 2 connections for unlighted single arm, maximum is 5 for lighted double arm signals but maybe this can be reduced to 3 when designed properly. Possibly the tube diameter can be reduced to 6.3 mm making the use of a standard jackplug possible. Click here if you want to see a small clip (620 kb) that proofs that the mechanism is soundless and relative slow moving.